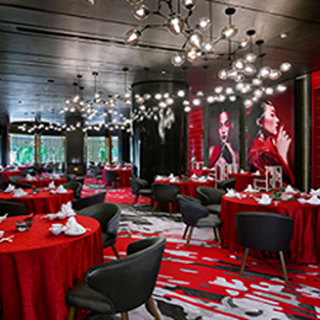 A modern Chinese restaurant with a red and black theme, offers a tempting menu featuring modern takes on Chinese specialties such as dim sum, congee, as well as grilled, stir-fried, live seafood and vegetarian dishes. There are also 4 cosy private dining rooms. Fishballs were hard and tasted bland. Bbq honey glazed chicken was salty. Red bean dessert was a little too sweet. Desserts were served too fast. We had not even finished our dim sum. Thus, we ended up eating melted ice-cream and no longer chilled mango pudding. Nice ambience, delicious dim sum and great service. Will definitely be back. 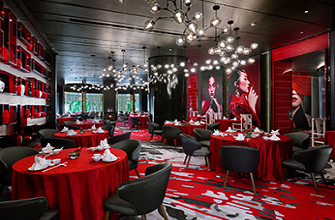 If you are an Accor Plus member, the weekend dim sum brunch priced at RM88 per adult is value for money. U can choose from 60 varieties of dim sum and desserts. Highly recommended. Wonderful experience. The staffs is very polite and welcoming. 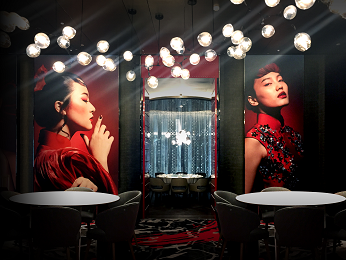 The newly renovated restaurant decoration is top notch. I feel like I am dining in a Hong Kong lavish restaurant. This will be my favourite  dim sum place. All good at the restaurant itself, other than the desserts which strangely took about half an hour to arrive. Food quality met expectations. Wait staff always prompt and friendly. Was told however, that the booking wasn't communicated by Accor to the restaurant. Just as well decided to call the night before to reconfirm timing (why is there no 11am option online? ), and fortunately there was a table. Can improve on the steamed prawn based dim sum which tastes frozen and not fresh. Don't understand why prawn dumpling has ginger taste perhaps to mask the un fresh ingredients. Increase vegetarian steamed Crystal dumpling options else all similar taste. Egg tart is cold despite long wait. Glutinous rice and steamed vege beancurd dumpling are the better items. Can offer cushions for the high chairs else very uncomfortable. Will be back so look forward to improvements in culinary skills. Food is good but a little salty for our taste. Environment looks nice and fresh. the restaurant environment is good, stuffs are friendly. Unfortunately, the food quality are below expectation only desert are exceptional. The manager on duty was very helpful and accomadating. Even though we book for 6 but he was very helpful to set us a table for 11 in a private corner for our lunch. We enjoyed our privacy and the food was excellent. Soup is the best. Other than that is either tasteless or oily. Food is great but less variety to choose in all u can eat dinner menu despite there have 55 dishes you can ordered. The cooking style mostly the same althought those are diffrent choices of meats/vegetables to ordered. Drinks are not included in the buffet menu. The environment is really nice when we were given a private & spavious room. it's one of my return trip to TZH. i requested for a room and they arranged perfectly for me. ambience and surrounding is perfect. the only setback i would say for my recent visit would be food was not served on a timely manner due to peak hour (as it's full) and the waiter did kindly inform us that the food will be late. however, the food is really late and we didn't manage to enjoy the food we ordered. some didn't even reach our table. so, it was quite disappointed. hopefully more foods can be prepared to cater all customer request since it's a buffet dim sum. there should be plenty to serve.